It's hard for me to believe it, but I'm about to start up my twelfth year of teaching. A lot of new teachers have messaged me on IG asking for some advice. When I sit down to reflect on my previous years, there is so much that I wish I had known when I first started. 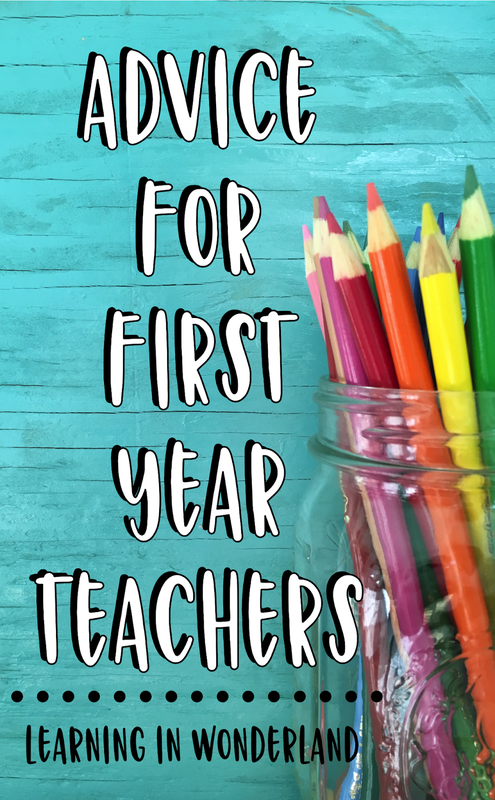 Your first year is going to be so special for so many reasons. Get a journal that you can keep in your room and document each day. Document special moments and document how you feel. You will want to remember these special times and as the year goes by, those memories will become fuzzier and fuzzier. This journal will keep those moments alive forever. Get to know your kids. This is important with all your kids, but especially the ones that might have challenging behaviors. When you get to know a child and they know that you care about them, they will want to do better for you. I've had many children in my class that unfortunately didn't even care about making themselves proud or their parents proud, but they knew I cared about them, and that changed everything. They did not want to disappoint me. Then the goal is turn that extrinsic motivation into intrinsic. Listen to the conversations that they have with one another in class and during recess. You will learn so much here! Bring up that topic later on with them. Have them share about themselves in class conversations. Read their writing. They will share a lot of their lives with you on paper. Ask questions. When you are walking in line, ask them about their weekend. Ask how their football game went. Ask them how their siblings are doing. Questions help your kids know that you care about their lives. Be authentic. Kids know when you care and are really listening to them. I teach in a school that has a reputation for being challenging. Some of my kids have seen things that I don't think most adults could handle. A child's background and experiences WILL impact their behavior. One thing my kids with that challenging reputation had in common was that they felt like no one was in their corner. Listening to my kids has helped me establish solid relationships with them. I never base things on previous behavior. I base them on the here and now and I will listen. While on this topic, don't even ask previous teachers about kids' behavior. What you hear about them can set up an expectation in your head and that can really work against you. Before handing out consequences, listen to all children involved in a situation. Children pick up on the idea that there are certain kids that can always be blamed for everything and that teachers automatically assume did something wrong. Do not be one of those teachers. Talk with all children involved in a situation. Listen to both sides. You'll find that many times the accused child did nothing wrong! Be an advocate for all your kids. Be fair and consistent. You'll sometimes to tempted to be tougher on some kids than other. Be aware that you are doing that and stop it. If you need time to process what has happened and aren't sure of how to handle it, send your kids back to an activity and tell them that you will need some time to think about their consequence. Kids respond really well to honestly. Consult with other teachers when you need help. If you aren't sure how to handle a behavior situation, consult a teacher friend (especially someone that is known for having great management). Hand out the consequences when you are sure that the consequences are fair for all parties involved. When you are harder on some kids than others, the kids will notice and they will learn that you are not a fair teacher. This will do some serious damage to your relationships. Over time the children that might be defensive at the beginning of the year, will realize that YOU are not out to get them and will start taking responsibility for what they did do wrong and stay under control when they are accused of doing something. You have to keep in mind that some of these children have gone through X number of years constantly being accused and blamed and receiving unfair consequences because they have been labeled as the "bad" kid. It's heart breaking but I've seen that happen a lot. I always acknowledge my kids when they learn how to control themselves. Be honest with them. I may say something like "Ben, I'm so proud of you. You used to get really angry when someone said you did something to them and now you are calm and are explaining what has happened." or "Miguel, I appreciate that you are accepting your consequence for ____ without getting angry. I'm proud of you." When you call home to discuss this with parents, explain to them how they are growing. Parents appreciate that. I remember my first day of teaching so vividly and the thought that ran through my head over and over again was "where's the grownup?" You are on your own and these little lives are in your hands. How the classroom runs is all up to you. I had a professor in college that had us develop a management plan in one of our classes. I put mine together and got an A+. I thought I had it handled, but guess what? None of it was an actual management plan! We weren't given a guideline as to what we needed to have in there. We were just told to create a plan. There are some essential pieces you need to have in your management plan. Take some time to figure out your rules and what is important in your classroom. Good management is so important. Bad management won't destroy your year but it will make things so difficult for you and your children. How will you get the kids' attention? How will they enter the classroom? How will they walk in line? How will they get their pencils? How will they get up to get class supplies. How will they move down to the floor for learning? What will you do when a child breaks a rule? How will they ask to use the restroom? When you develop your plan think about how your mentor teacher did it when you student taught. Did you like how she ran things? What would you change? Have those expectations in your mind and make them known to your kids. Kids will rise up to your expectations. It can be overwhelming. Take it one step at a time and write it all down. Worst case scenario is something doesn't work and you change it. It's not a big deal. I tell my kids all the time "we are going to try this and if it doesn't work, we'll change it" they are so open to change and most importantly, honesty. Find a group of friends that are positive, helpful, and will help you grow. Try to avoid that teacher that always complains about the kids or constantly gripes about admin or teaching. Those teachers have a way of bringing you down. Within your group, you can definitely express your frustrations, but it's not helpful to be with a group of people that is always negative. Ask your people for ideas and feedback about your teaching practices. When you do that, make sure not to take it personally. Sometimes you'll get advice that doesn't work for you and sometimes you'll get advice that you may not want to hear but is useful. If it's useful, apply and grow. 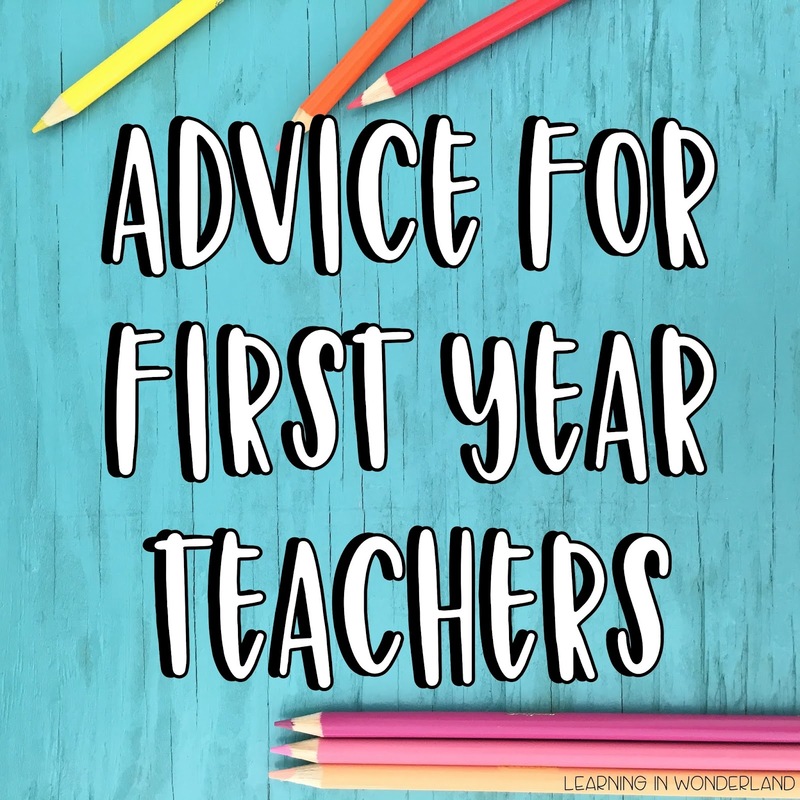 Your first years are going to be full of growth and that is a wonderful thing. Data is important but it is not the end all be all of teaching. When I began teaching we had a principal that would project our scores during staff meetings for everyone to see. Whole team data and individual teacher data was on display every quarter. We all knew everyone's scores. Some teams got applause while others got silence. We had team meetings often to discuss data. As a result I became very data driven. So much to the point that I didn't even get to know my kids very well my second year. I was either testing them as a class, testing in a small group, one-on-one, or prepping them for testing. Our scores were phenomenal but... was it worth it? Not even a little bit. Praise is nice but I did not become a teacher for the praise. I became a teacher to work with children and help them. I'll always regret my decisions that year but I learned something so valuable. Test scores are not worth throwing away a year of a child's life. Since test scores are important and they do matter (they are often used for your evals and sometimes used to decide whether to renew contracts or amount on bonuses/stipends/extra payouts) you will need to find a balance. Ask seasoned teachers for testing tips. Teachers in your grade level most likely have practice tests ready to go. Prep your kids when it's time for it but don't make that the whole year. Focus instead of getting to know your kids and helping them love school. That is a much better use of your time. Play fun review games throughout the year to keep those concepts fresh. This will keep you from feeling like you have to cram right before testing times. You need to remember this. Every time a holiday comes up you will notice that your patience is going to get tested. Kids will start to misbehave. They might have a hard time concentrating in class. They might fight on the playground. Children get excited very easily. Especially the younger ones. It took me three or four years to realize that holidays made my kids insane. Now that I know that, I know how to handle it so that things don't spiral out of control. Keep calm and review your rules over and over again. Have conversations with your class about staying in control even if exciting things are happening. Embrace the chaos. Just try to enjoy yourself even if it's hard. When in doubt, stop everything, bring them to the carpet, and talk about your expectations. To piggy back off of #6. Do not yell or talk over kids. If they aren't listening, yelling over them isn't going to help. They will not listen if you are always yelling. Your yelling voice will become the norm and your voice will lose it's power. Don't be a yelling teacher. It does no good and you'll literally lose your voice over and over again. Have your quiet signal ready to go, refocus the kids, and then continue speaking. 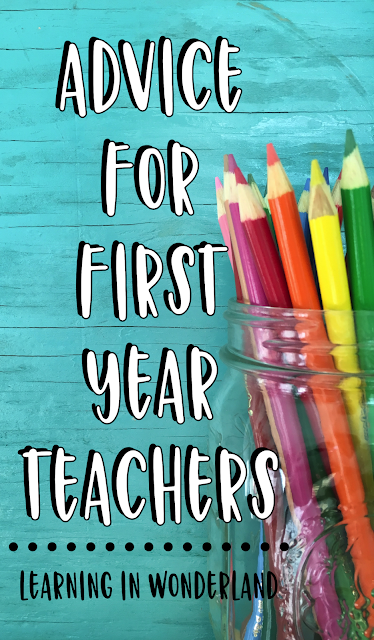 I feel very fortunate to have started teaching before IG, FB, Pinterest, and teaching blogs were a thing. All that hit around my 5th year of teaching and it was like an electrical surge hit my career. I loved it! I was so inspired and I suddenly had so many ideas at my fingertips. Over the years I have seen more and more new teachers get so overwhelmed with all of it. Please do yourself a favor and don't compare your room or teaching style to anyone. It's not good for you! If you are doing what you can for your kids, that is more than enough. If you are worried about decorating your room because you see IG teachers go all out, keep this in mind; I didn't full on decorate my room until my 6th year. I don't even have pictures of my classroom from my first five years of teaching. I have lots of pictures of my kids and things we did, but not even one of my decorations or my room. It just wasn't even a thought in my head. I set up my room how I thought it would work, decorated a little, and focused on my teaching. If you are new and want to go all out, go for it! If the thought of decorating is stressing you out, it might be best to hold off on that or start small and add little bits each year. While I didn't have social media to compare myself to, I was placed next to a veteran teacher that had it all together. I did compare myself to her. It was hard for me because I felt like I could never measure up. She was the teacher that all the parents requested. Later on I discovered that she had felt so intimated by us new teachers that she felt like she had to step up her game in every aspect to stay ahead. This might explain why she basically lived at school. If only we had discussed these feelings, we could have avoided so much stress. Do yourself a favor and give yourself permission to leave on time and have a life. When I began teaching I'd stay at work so late. I'm talking really late! Somedays as late as 10pm. I felt like there was so much to do and I could never catch up. I hate to break it to you, but you will never be caught up. You need to find a way to be ok with that. Teaching is one of those careers where it feels like there is always more to do and you aren't doing enough. This will lead you to burn out so quickly! I was going home so tired, I'd eat, sleep and come right back to work. Even though I loved my job I started to resent it. As the years have gone by, I have changed my behavior. I now allow myself one late day to copy and organize (my day is friday because even if I stay late, I can sleep in the next day) but I leave on time the rest of the week. I try to be at work from 7-3pm from Monday-Thursday. I am a much happier person now and much happier with my career. Try to clean and organize throughout the day. If you spend five minutes here and there cleaning up, you'll see that your room will be clean for the most part. Have your students help. Throughout the day they can tidy up their areas and make sure there is no trash on the floor. We are often short on custodians and sometimes will go days with no one cleaning our rooms. It's up to us to keep it as clean as possible. Use your time wisely. It's easy to spend time chatting in the neighbor's class your whole prep. Instead of doing that, use that time to get at least one thing done. Grade one test, clean up your desk area, prep the next lesson. Give yourself a few minutes to unwind and chat but focus on getting something done. If you are having a hard day, do something during your prep that will make you feel better (complaining to the teacher next door for your whole prep will not help you). For me that was staying in my room, turning down the lights, and turning on some music. I set an alarm for 10 minutes for me to relax and refocus. This was a game changer for me during a really difficult year. I think everyone says this, but they say it because it's true. If you ever get to the point where you hate your career choice and are miserable, it's time to reevaluate and figure out what you can do to change that. Some teachers burn out and leave the field because they feel so stressed and overwhelmed. Do what you can to not burn out. Have fun with your kids. Be flexible with your plans. Throw in fun activities here and there. Do some Gonoodle with them, play with them at recess, read fun books! Teaching is the best and I wouldn't do anything else, but teaching is a hard field and it can be stressful. Find ways to make it less of all that and more about you and the kids. Always remember your why. I hope that helps someone out there about to begin this journey! If you found this post helpful, make sure to pin it so that you can come back to it later during the year. Thank you so much for this article! I have been teaching for about 4 years now and I still feel like I have so much to learn! Most of what you said, I have had to learn the hard way on my own! But all of it really resonated! Excellent advice!! Wish I would have known it sooner!! Everything you wrote in this article is so true. I experienced every single feeling-emotion-concern you wrote about during my first year of teaching which was last year. Thank you for all the helpful tips! I will be remembering your advice for this new school year. I am about to begin my first year of teaching and I am already feeling overwhelmed. The advice about the decor hit the nail on the head for me. 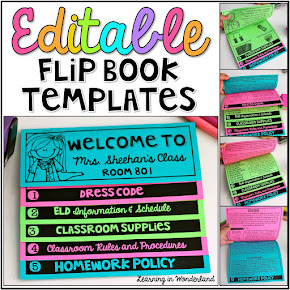 IG and Pinterest make me feel like my classroom has to be perfection the moment the students step into my classroom. I am trying to learn some tips from those teachers but not get carried away. I am bookmarking this article to refer to as much as I need. Thank you for this, you are incredible! Thank you for your wise advice. I will be finishing grad school in a few months and looking forward to my first Teaching position. What wonderful, helpful advice. I'm a tutor, so I haven't been having to manage an entire class. I agree with all of the emphasis on the positive! 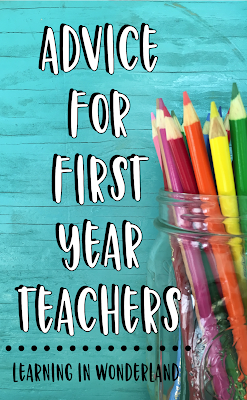 I'm now going to be substitute teaching this year, so classroom management will be a huge deal, and that is making me nervous! You sound like a wonderful teacher. Thank you for writing and sharing this article. I appreciate your advice. I'm a first year teacher although I have been in the classroom working part time for the past 9 years. Even with all my experience I'm struggling and tired but after reading your article it reassured what I have been telling myself. My room doesn't have to be perfect, I don't need all the fancy TPT resources right now, and the the most important thing is to develop relationships. Thanks again! I have quite a bit of articles about advice for first year teachers. But I have never read about keeping a journal throughout a teachers first year. I think this is a great idea to hold memories and to reflect on each day! What good advice this is! Love this!